Find the perfect Kong toy for your dog. Dogs love the Kong rubber toys because of the unpredictable way they bounce and the peculiar hive shape. They're hollow, so you can wedge in treats or peanut butter for more interest. Popular with our customers for years! Classic Kong - For typical Chewers, Medium/Hard Rubber, Recommended for most adult dogs. Color Red. 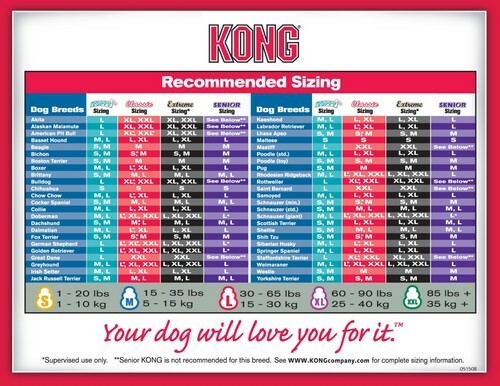 Enlarge the picture above to see Recommended Sizing for your Breed.